The U.S. Bureau of Safety and Environmental Enforcement (BSEE) provided the latest details on its efforts to improve oil spill response technologies at the Arctic Oil Spill Response Research and Technology Workshop held in April. The BSEE works to promote safety, protect the environment, and conserve resources offshore through vigorous regulatory oversight and enforcement. 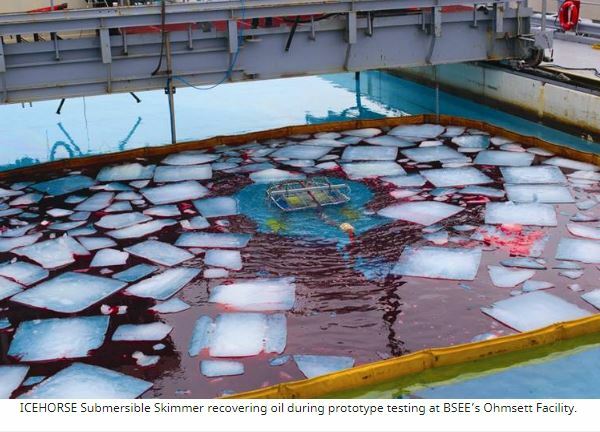 Bureau staff presented results of several BSEE-funded projects including the development of a submersible skimmer prototype for oil recovery in and around broken ice. “At the workshop, we all worked together to collectively understand the suite of response technology possibilities that are available today as well as those that may become available in the near future,” said David Moore, chief of BSEE’s Oil Spill Preparedness Division. “Developing and refining technologies for oil spill response in the Arctic requires collaboration on a global scale,” Moore added. The April workshop was organized by the Arctic Council’s Working Group on Emergency Prevention, Preparedness, and Response, and attended by subject matter experts from the U.S., Canada, Iceland, and Norway. Discussion focused on three separate areas that are key to an efficient oil spill response – traditional mechanical response countermeasures such as boom and skimmers, evolving response countermeasures such as in situ burn and dispersants, and response optimization that includes remote sensing devices and common operating pictures. The U.S. is one of eight nations that serve on the Arctic Council as a permanent member. BSEE serves on the U.S. Delegation to the Arctic Council’s Working Group on Emergency Prevention, Preparedness, and Response, which is one of six working groups of the Arctic Council. Members of the Working Group exchange information on best practices and conduct projects to include development of guidance and risk assessment methodologies, response exercises, and training.